In this Example we will learn how to perform a single factor or One way ANOVA in Excel. A single factor or one way ANOVA is used to test the null hypothesis, i.e. the mean from all the population are all equal. And alternate hypothesis is at least one among the mean is different. H1: at least one mean is different. 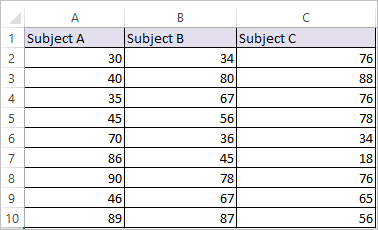 Let’s take an example of marks scored in three subjects, to demonstrate One way ANOVA in Excel. Step 1: On the top right corner of the data tab click data analysis. Note: if you can’t able to find the Data Analysis button? Click here to load the Analysis ToolPak add-in. 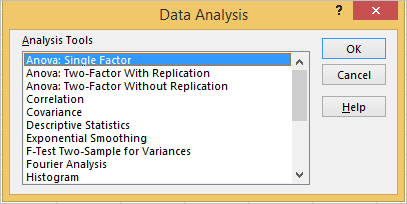 Step 2: Select Anova: Single Factor and click OK. If F > F crit, we reject the null hypothesis. In this case F crit value is 3.402826 and F value is 0.071109. So we cannot reject null hypothesis. So mean of the all the three subjects are same. If you want to test the mean of two subjects you can use T-Test.